Big firms will "push non-reserved work into unregulated businesses"
Major law firms will soon “eschew the solicitor brand” in favour of conducting non-reserved legal business in the unregulated sector, the compliance officer at a top City firm has predicted. Meanwhile, regulation by the Solicitors Regulation Authority (SRA) has received votes of confidence from one large firm and from sole practitioners, but City firms are sceptical. 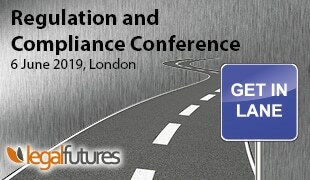 Speaking at the Legal Futures Regulation & Compliance Conference in London, Jo Riddick, the compliance officer for legal practice at Macfarlanes, said solicitors were becoming less relevant in terms of services to clients. Ms Riddick asked how relevant the “badge” of regulation would be to legal brands when “well-funded and well-managed players” entered the unregulated sector. She suggested the solicitor brand would become less important “when large and City firms jump into the unregulated market to provide non-reserved activities – possibly with other professional service providers, [maybe] accountants… technology experts, or project managers, providing high-end services… to sophisticated clients”. Also in a session on the reality of SRA regulation, Simon McCrum, managing partner of Oxford firm Darbys Solicitors, raised eyebrows when he described the SRA as a valued “business partner”, whose officials’ input was “uplifting”. He said that since Darbys had grown to become a ‘high impact’ firm with turnover exceeding £12m, so becoming part of the SRA’s relationship management system, he had come to value the connection. Along with the firm’s professional indemnity insurer and the bank, the SRA has become its “third business partner”. Some of this enthusiasm was shared by sole practitioner (SP), Hilary Underwood, the former chair and now co-ordinator of the Sole Practitioners Group. She highlighted improvements in the relationship between the regulator and SPs, particularly in relation to start-ups, the provision of more guidance on compliance, and in its understanding of pressures on their time. “The SRA is a lot more willing to listen to SPs… to shift the way in which they liaise with us and communicate with us… The feedback we’ve had from our members has been extremely positive. However, Ms Riddick said the centralisation of risk management and compliance functions within City firms had made the case for self-regulation compelling “particularly if they have sophisticated clients… Arguably the market will provide its own protections because you will have that ubiquitous client service message coming down from the top”. She added: “I think client care is one of the areas where there is a case for different levels of regulation, where it might be appropriate for firms with a lot of consumers for the SRA to say ‘you need to tell your clients about what you are doing, inform them of their rights to complain, and so on’. The only areas where SRA regulation continued to add value to City firms were in the international market, where the “badge” of regulation still had currency, and in legal professional privilege, she said. 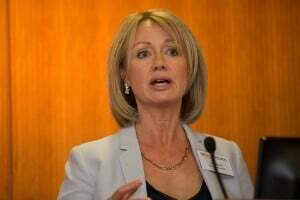 From the floor, former Law Society president Linda Lee complained that law firms had been the victims of a “massive experiment” in regulation that had “cost millions upon millions” without delivering benefits to clients.